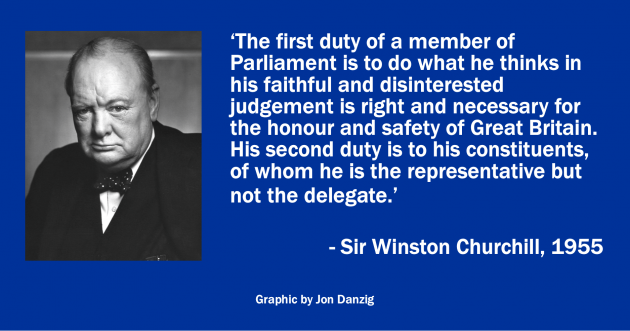 The first duty of all MPs is to put the safety of the country first. Contrary to popular belief, MPs are not beholden to follow the opinions of their constituents. That means that MPs in constituencies that voted for Leave are not under any legal or constitutional duty to support Leave if they believe that is not in the best interests of Britain. Conversely, that also applies to MPs in constituencies that voted for Remain. That in itself does not mean those MPs must also support Remain, if they don’t believe it’s in Britain’s interests. 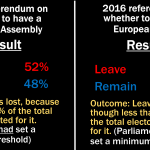 Also contrary to popular belief, MPs are not beholden to follow the result of the 2016 EU referendum. 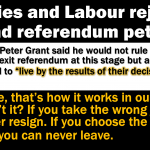 That referendum was advisory only, not legally binding, and Parliamentarians were (and are) under no legal or constitutional obligation to ‘obey’ that referendum. MPs are not the delegates of their constituents. They are representatives. MPs are free to act in whatever way they believe to be in the interests of the country. Indeed, they have a solemn duty to do so. The country comes first. Their constituents and their party come second and third. 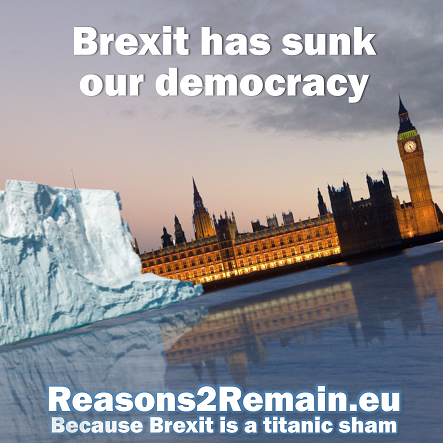 Before the referendum, Parliamentarians by a huge majority – around 70% – would have voted for the UK to remain in the EU, because they believed that was in the best interests of our country. None of the facts have changed since then, except that a highly divisive referendum offered a different point of view, by the slimmest of margins, and by a minority of the electorate. For complicated reasons, MPs felt bound to ‘respect’ the result of the advisory referendum, even though in the heads and hearts of most of them, they didn’t believe that Brexit was in Britain’s interests. Britain is facing the worst constitutional crisis in generations. We are due to leave the EU within a few weeks, either with a deal that most MPs don’t support, or without any deal, that most MPs don’t want. And the decision must be made next week. Or MPs could push to give ‘the people’ a new democratic opportunity to reconsider Brexit, now we know so much more than we did in 2016. 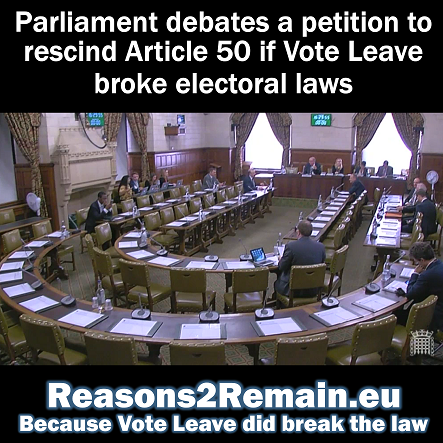 Or they could vote to revoke Article 50 and to bring an end to Brexit. It’s time for all Parliamentarians to examine closely the onerous responsibility they must now confront. Should they act in the narrow interests of their parties; in the fear of losing their seats if they upset their constituents, or in the overwhelming interests and safety of the UK? There is no doubt about the first and foremost duty of MPs, overwhelmingly agreed by Parliamentary precedent and practice. As published by our Parliament the role and duty of MPs is clearly stated by two leading authorities on the subject, the 18th Century Parliamentarian Edmund Burke, and Britain’s greatest 19th Century war leader, Winston Churchill. “Parliament is not a congress of ambassadors from different and hostile interests, which interests each must maintain, as an agent and advocate, against other agents and advocates; but parliament is a deliberative assembly of one nation, with one interest, that of the whole; where, not local purposes, not local prejudices ought to guide, but the general good, resulting from the general reason of the whole. “The first duty of a member of Parliament is to do what he thinks in his faithful and disinterested judgement is right and necessary for the honour and safety of Great Britain. “His second duty is to his constituents, of whom he is the representative but not the delegate. “Burke’s famous declaration on this subject is well known. “It is only in the third place that his duty to party organization or programme takes rank. We have heard that a number of MPs have received death threats by people who disagree with the way they are speaking and voting. That is reprehensible, and entirely unacceptable. Please support your MP to do what they believe is right for the country. That’s their first and foremost duty, regardless of your opinion, or mine. 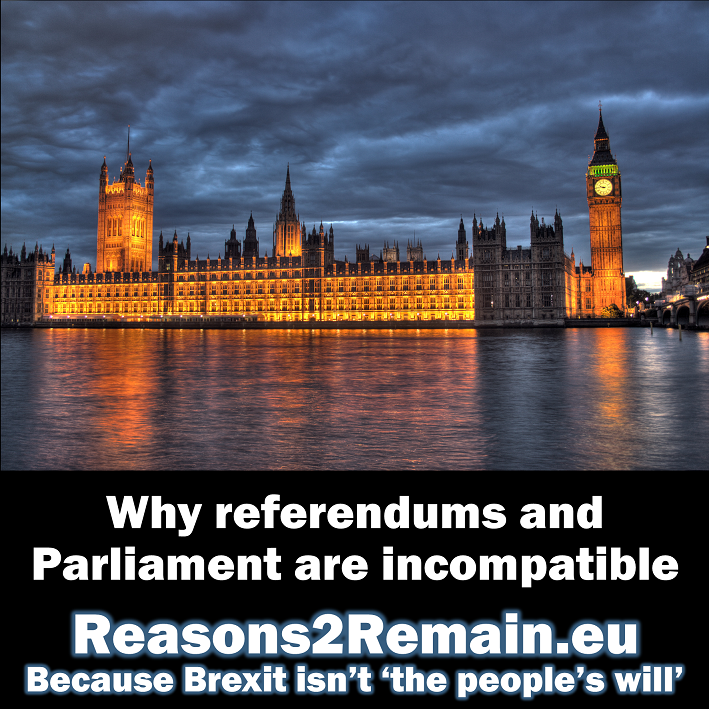 This entry was posted in Current Affairs, Democracy & Citizenship, Politics & Public Policy, The EU and tagged Article 50, brexit, democracy, European Union, John Bercow, MPs, Parliament, Winston Churchill Edmund Burke. Bookmark the permalink.